Carolyn wrote telling me she is headed to the Chile Santiago North Mission. She had some great questions. I read about the fleas…and i’ve heard alot about them!!! I didn’t know if you found a way to prevent them? The fleas won’t be bad everywhere you serve. I was in Chile around a year before I saw my first flea. Keeping your clothes separate from your sleeping area is a good idea. However, you’ll often be living in small quarters where a flea can easily jump around anyway. Fleas are like little guided missiles and will find you, often jumping across the room to get you. I had some fellow missionaries that would put a dog’s flea collar in their bed during the day to keep pests away. You can always hang out your sheets and or clothes that get infested outside your sleeping area. I give some tricks on how to catch fleas on my fleas page. If for some reason I need a new skirt or blouse, or whatever, are there good quality department stores where i’ll be able to buy something if needed? Santiago has very modern shopping, particularly in parts of the North mission where you may actually think you’re still in the United States. I won’t worry too much about clothing replacements. One word of caution is that when shopping at big retailers, you’ll probably pay equivalent prices to those you would here in the US. However, you won’t have that much money to spend since your peso allotment will be smaller. If money is tight, you can always buy from local street fairs or smaller stores you find where you are serving. I think you mentioned you served in the Southern part of Santiago so I really don’t know if you’ll be able to answer most my questions. I did serve in Southern Santiago but spent more than my fair share of P-days in the North visiting downtown Santiago and the very US-like Las Condes area. Our mission home was actually in the North mission as were the mission offices. I’m curious about shipping…my family is in Austin, Texas and so if my mom wanted to mail me something…how expensive is it? Do you have any idea the postage per weight? Currently it looks like a 1 pound package will cost $18.00 for 6-10 day delivery. 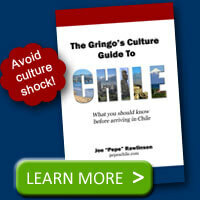 One thing to keep in mind is that large packages may draw suspicion from Chilean customs. I had a family friend send me a very large box once and it was delayed several months, had items removed from it, and I was hit is a “tax.” Ouch! After that I made sure my mom used those manila envelopes with bubble wrap built in. She would spread any goodies across multiple of those smaller padded envelopes and they all got through fine. I had companions whose families would put big “missionary supplies” stamps on the packages with pictures of Jesus. That seemed to work too! What was your experience as far as drastic weather conditions? It got really hot in the summer but usually we didn’t have much rain during those months. When it got freezing in the winter, there usually wasn’t any precipitation and thus no snow. Of course, if you serve up in the mountains, you will probably see more snow and colder temperatures. If you’re in the city, most everything is paved. In the countryside (like I served in Buin), you’ll get more dirt roads and mud when it rains. Did it get really hot and humid??? Really cold? I’ll be arriving in the mission field to my knowledge during the winter months…does it get pretty freezing in northern santiago? It wasn’t really humid where I served. In the winter it would get down to freezing sometimes. Winter was very wet, with lots of rain. The summer in the lower 30’s Celsius which is the upper 90’s to 100 F max. 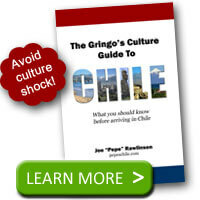 I have some information on Chile’s climate on my site. What would you say, as a missionary, was either the one thing you did have or wished you had on your mission (or more) that you knew served you the best and something you never used? Flip flops for the shower where great. I also had plastic shoe covers/boots that I’d wear over my shoes when it rained. That was a lifesaver since when it would rain, the streets would flood. Long johns for the winter would have been nice but when I asked my parents to send me some it was summer back home and those were hard to find. By the time I got them, spring was in full bloom and my need had passed. Almost anything I needed I could buy locally or get from my parents via a package. I did take a two year’s supply of contact lenses solution and cleaner which in retrospect was overkill. I hope these answers help! Let me know if you have any more questions. I love your info about Chile pages. I am living in Antofagasta now in the North of Chile and thought I would add a note to say that long johns are definitely a good idea. I was in Santiago ten days ago and it was truely freezing. The airport is not heated (neither is my apartment here in the north or my classroom). I love my life here but wish I had brought more warm clothes. I am buying a bit as my salary allows. Thanks for your kind comments. Best of luck to you! in 1976 serve in santiago south mission. trust me!! flees where a problem then. my granmother sugest to put a bunch of herb called POLEO, that you can get in the markets for few pesos, and put it inbetwen your blankets. belive me , it really works!!! now in australia i use the same on the dogs bed and it woks . all the best to you , and god bless you on your mision. why didn you bought a pair long johns in Patronato or any other place? I went to live to Sweden and it is pretty cold here, so I made it sure to have enough of those long johns, or “calzoncillos largos” in Chilean. This is great! I lived in Santiago (downtown) for a bit working for the LDS Centro de Empleos as a volunteer. My sister just got called to the Vina del Mar mission. Since I was in the rich spot of town, I didn’t have problems with fleas and I was only there during the summer. The additional info will be great to pass on to her!